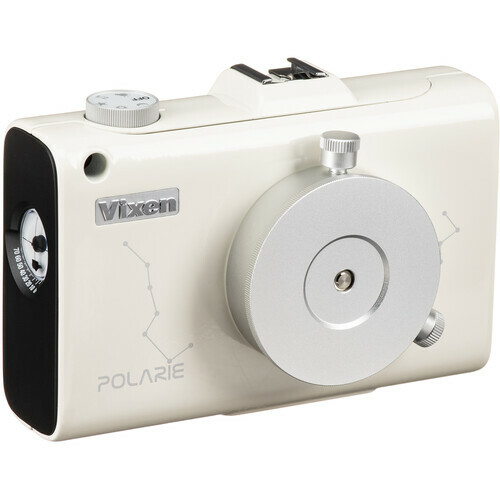 The Polarie Star Tracker from Vixen Optics is an incredibly compact, motorized, tracking mount. The smooth and sleek, visually attractive Polarie attaches to a standard camera tripod with a ball head on one side and a DSLR or smaller camera on the other up to 7 pounds. Point the Polarie north with the integrated compass, use the alignment window by pointing it at Polaris, the North Star, or use an optional polar scope. Star trails and false fuzzies are eliminated in the time exposures of the attached camera as the Polarie tracks the motion of the stars across the celestial dome. Two user-supplied AA batteries can power the unit for ~4 hours or an optional external power supply (not included) can be used. Although, not waterproof, the Polarie is designed to function in most weather conditions. It weighs in at less than an incredible 1½ lbs and is about the size of a paperback book. This is one cool astrophotography star tracker. Box Dimensions (LxWxH) 8.9 x 6.55 x 2.85"
Polarie Star Tracker is rated 4.6 out of 5 by 18. Rated 4 out of 5 by Frito Bandito from Produced great results the first time I bought this for a professional gig to shoot a specific constellation for a television show. I had never done astrophotography before, but with a good bit of research and the Polarie the results were great. It worked right the first time. It does not come with batteries (2xAA). If you mount this to your regular tripod you WILL need a second head to orient your camera after you've oriented the Polarie to the North Star. I took off one star on this review because sometimes the North Star was diffult to line up through the finder, a problem that could probably be fixed by getting the precision finder accessory. I did not get this. If I could give it 4.5 stars, I would. Rated 5 out of 5 by Bob from Excellent results I did a quick alignment to polar north ( Polaris ) with my Canon EOS M and 22mm M lens at f2 attached and took a 30 second bulb exposure. Stars were pin sharp. Increase aperture to f 2.8 and exposed for 60 seconds. Pin sharp. Went to f4 for 90 seconds-very slight blurring. Fine tuned polar alignment- pin sharp. The EOS M and this tracker are a great combo! Get an RC-6 remote shutter controller for bulb mode on the EOS M. Also worked well with my Canon 400mm f5.6 and the M.
Rated 4 out of 5 by RL from Solid product by Vixen Optics My interest is astrophotography, deep sky, occasionally planetary, and recently became interested in include Landscape Astrophotography. Wanting a portable platform I looked into the Polarie by Vixen, having read other reviews, decided to give it a go. The unit is solidly built, nice size, and it is apparent a bit of engineering thought went into the design. I would add having tracking rate options is a great idea. First night out, 20F, in a bit of wind, the Polarie performed better than I expected, noting an 3 fold improvement of imaging time. Carried the weight of the Canon 6D, 100mm prime lens without any issue. My Polar alignment could have been better I am sure. I followed the manual and added an older Vixen polar scope to the process. I am impressed, the Polarie will be a very nice travel package for DSLR photography. Rated 5 out of 5 by extolstudios from A must have for astrophotography! I read many reviews about the Polarie and never found complaints. After receiving the polarie, I took it out in the back yard to try it. I used the built in sight to align to Polaris and had great results with wide field 18mm shots. I then took out my compass and inclinometer and set it by placing the flat side of theses devices on the surface of the Polarie and adjusting the standard tripod head. I was able to shoot 2+ minuite exposures with a 200mm lens with no star trails. The design is rugged and able to handle the weight of longer lens. The Polarie addes some additional weight so make sure your tripod and head can handle all of your gear. The Polarie is compact and easily fits into you camera bag so it's easy to carry with you. I'm truly impressed with this device. I've actually been able to shoot deep space star clusters at magnitude 6.4 using a Canon EF-S 55-250mm lens aligning the polarie with a compass and inclinometer. If you like astrophotography, thie Vixen Polarie is a must have. Rated 5 out of 5 by jubophoto's wife from Well Liked Bought this for my husband for his birthday. He immediately went out to take star pictures with his 5d 300 mm lens. Although this camera is slightly heavier than the Polarie recommends it still works wonderfully. My husband says it was well worth the money spent if you enjoy taking star pictures. Rated 5 out of 5 by Sam from Simple and effective Setup is easy and the results are good. I use it with a precision slow motion pan/tilt adapter, which makes the polar alignment very easy. Rated 4 out of 5 by martyk from easy to use star tracker i get about 2 and 1/2 minutes of good tracking with a 50 mm lens and that is without the optional polar scope, which i would consider buying if it had a light to illuminate the reticle (based on previous reviews). easy to set up and use. no indication yet of low battery after about 10 uses. Rated 4 out of 5 by Kas from Great results for the price I've only had this out a few times thus far, but it's been quite impressive, especially given the cost vs most of the other star tracking mounts. Operation is smooth and quiet, no vibrations or anything to throw your camera off track. The build quality seems very good, it's much sturdier seeming than I'd envisioned. Sighting Polaris through the tiny viewfinder was a bit tricky, but works fine. I may try mounting a laser pointer to the hot shoe mount on top to make future sightings easier.Also note that you really do want a strong ball head mount, especially for the mount which sits on the tripod, as it's not only carrying the camera's weight, but the weight of another ball head and the Polarie as well, which isn't featherlight. Given the extreme angles which you sometimes want the camera to be on, the rotational force exerted by the whole thing can get pretty high, and I had to switch out my mount for a stronger one.Excellent system, looking forward to doing more, especially with the moon, and some with my telephoto lens. I live in the southern hemisphere (about 120 kilometres south of Sydney) so where would the point of time be here, south via the Southern Cross? If you get the Polar Axis Scope accesory it will help you to point to a well known asterism in the southern hemisphere near the South Pole axis. You can check the manual in the vixen website for further details. Is there a smart phone app you can use to align to north star? I use the Google Sky Map app on my android phone to generally get me started in the right direction. Regarding purchasing the timelapse bracket and using it for night scapes or sunrises, isn't it a little slow for this? Is there a double speed mode to do 30 deg in 1 hour? Does this unit require additional mounts to use it right out of the box? You will need to attach a ball head to the Polarie to mount a camera. A ball head is available from many manufacturers.